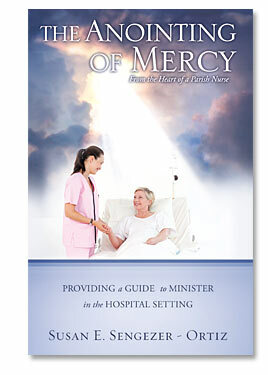 Author Susan E. Sengezer’s The Anointing of Mercy is a pocket-sized book with enormous-sized content. It will change how you look at the miraculous power God avails to every Christian, and how every caregiver sees their position, responsibility, and authority of providing care to others. On the mission field every day in a busy emergency room trauma center, parish nurse Susan E. Sengezer models the love of Christ with everyone she comes in contact with. Having been victim of a hate-crime herself, all alone, left severely beaten with multiple broken facial bones which could have left her disfigured for life, she is healed by the compassion of another’s prayer released over the phone and her faith to believe and receive it. The healing power of Jesus Christ still exists through faith and prayer today! From her early childhood years, she realized the touch of God and the Anointing Of Mercy which He has placed on her life; and which she has exemplified throughout her life, career and ministry. If the reader is a care-giver in any sense of the occupation, they will be touched by this powerful account of these few documented experiences in her numerous years (and counting) as a care-giver—in the true sense of the occupation.